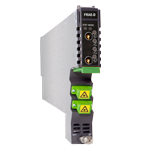 The Analog Forward Receiver - Enhanced (FRAE) is designed to plug into PBN's latest generation Advanced Intelligent Multi-services Access platform - the AIMA3000. The FRAE is available in single or dual port configurations. It incorporates a low noise front-end circuit that receives optical wavelengths from 1260 nm to 1620 nm and converts them into RF signals for Master Antenna Television (MATV), CATV, and broadband applications. The supported RF bandwidth is from 45 to 1218 MHz. The module offers a superior frequency response with a low distortion profile and low noise characteristics. Having high sensitivity, the module is suitable for long distance applications. 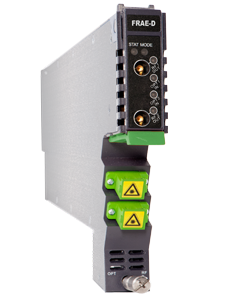 The FRAE optical receiver module features automatic gain control (AGC), which is based off of RF power. The RF output AGC threshold level and the slope can be managed remotely. (2) Loaded with 64 channels 256 QAM, measured with PBN referenced optical transmitter (FT5X-Q) @ -3 dBm, 2%~3% OMI, 348~596 MHz, 60 km.